The McLaren Senna is certainly quite an attractive car, with 789 hp (800 PS) in a body that barely looks road legal. However, what if you want the same car, but without the ability of drive it on public roads? Well, McLaren has got just the car for you. This is the new McLaren Senna GTR, a track-only concept that previews a future production model that customers will be able to buy. Since it doesn’t have to conform to pesky on-road regulations, McLaren has been able to give it more of everything – power, grip and downforce. 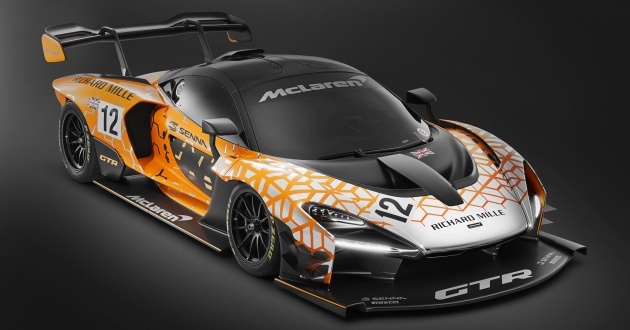 We’ll start with the first bit, with McLaren saying the Senna GTR will have at least 814 hp (825 PS) and greater torque from the 4.0 litre twin-turbo V8, which is also found in the standard Senna. Paired with a race-style transmission, the carmaker expects the car to be faster in a straight line compared to its road-going sibling. For added grip, the car also comes with revised double wishbone suspension and slick Pirelli tyres with new wheels. As for downforce, there’s now 1,000 kg of downforce being generated instead of the measly 800 kg from the standard Senna. Revisions that help contribute to that figure include wider fenders (resulting in a wider track too), a larger front splitter and rear diffuser, a low rear deck for cooling and aero performance as well as an active rear wing. Other changes involve the doors, with the outer skin being “pushed in” as far as possible towards the centre of the car for better channel airflow. Oh, the standard window has been replaced with a polycarbonate one as well, because race car. As mentioned at the start, the concept previews an upcoming model, whereby only 75 examples will be produced. Seeing how all 500 units of the road-going Senna were sold before it was even launched, we reckon McLaren won’t have a hard time finding customers for this new car. If anyone have $1 million lying around, U can order one NOW. U better have a large garage to store this as it will most likely be house there most of the time. If U buy the road-going sibling, your neighbors will be giving U a stare every time U start the car as the whole neighborhood will be mad at U for causing nuisance. After all has been said & done, no M’sian will buy one as this is deem too outrageous & it will attract MACC attention. This will likely be kept in a climate controlled glass box instead of stuffy garage.